After the A80 octa-core was released for smart OTT box market in 2014, A80 nearly dominated the professional gaming box market in China by virtue of its best features and performance. Allwinner’s long-term commitment to that market became clear last March with Allwinner is going for platform standardization by joining the new Digital Home Group of Linaro to prevent fragmentation of effort in the TV/STB/media space [this same blog, March 20, 2014]. So in September 2014, Allwinner launched the H8 octa-core to grab more market share of smart OTT box market segment priced $50 to $80, and now with the advent of Allwinner H3, a full 4K OTT solution is targeting the OTT box market segment priced $35 to $50. As H3 is including H.265/H.264 4K video processing in hardware, and 4K video point-to-point output, it is outperforming many high-end OTT solutions in the market. Smart OTT Box prices with the H3 are already starting at $32 in China making it possible for ordinary consumers to enjoy the stunning full 4K visual experience with affordable price points. 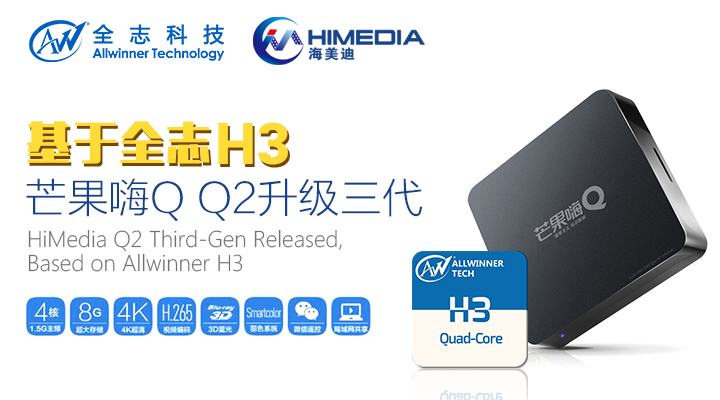 [Zhuhai—January 19, 2015] Recently, Chinese OTT box brand HiMedia upgraded its popular Q2 smart OTT box to the third generation, packing Allwinner H3 quad-core processor. The HiMedia Q2 Thrid-Gen outshines in its performance, but its price remains 199RMB [$32], just like the Second-Gen. It’s slated to go on market in Jan.
[Zhuhai—January 4, 2015] Allwinner Technology, a worldwide leader in application processor design, today announced its new full 4K OTT box solution H3, after its release of octa-core A80 and H8 solutions for smart OTT box market this year. 4k is gaining more popularity in smart OTT box market now. 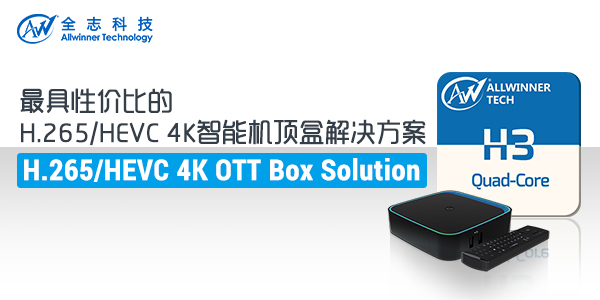 As the leading solution provider in Chinese OTT market, Allwinner adds complete 4K support to its latest H3 solution, including supports for H.265/H.264 4K video processing in hardware, and 4K video point-to-point output, outperforming many high-end OTT solutions in the market. 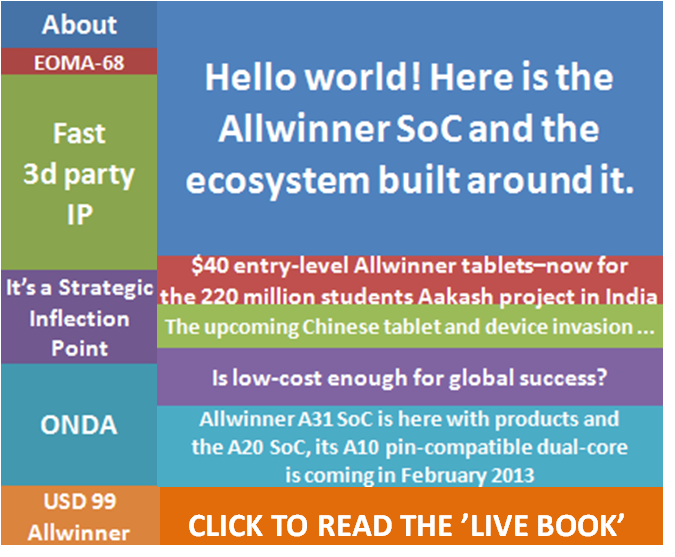 In terms of specification, Allwinner H3 packs four ARM Cortex-A7 CPU cores and Mali graphics that running above 600MHz. It can decode H.265/H.264 4K video in hardware up to 30fps, and integrates peripherals including HDMI, CVBS, Audio codec, four USB ports, Ethernet+Phy to make the cost more competitive. Additionally, H3 supports a Trustzone-based security system t-Coffer to ensure the system stability and safety, which supports various security features (such as Root-of-Trust, secure boot, secure storage, etc), multiple DRM solutions (such as Google Widevine L1, Microsoft Play Ready, Marlin, etc) and HDCP, etc. It’s also worth noting that H3 comes with Allwinner’s latest patented SmartColor display technology to deliver better visual effects for consumers. The first smart OTT box sporting Allwinner H3 quad-core is slated to hit the market in Dec. 2014. HongKong— Oct 11, 2014 — Allwinner Technology, the leading application processor designer, today released its new octa-core H8 System on Chip (SoC) for high-end gaming and video OTT box markets at the HongKong Electronics Fair. Based on TSMC’s 28nm HPC process, this new SoC delivers premium system performance with low heat, enabling ODM/OEM manufacturers to produce OTT boxes at competitive BOM costs. H8-based OTT boxes are predicated to hit the market in Q4, 2014.